Now that the White House has turned into a stable of climate change deniers, those who facilitate climate change are trying to grab hold of their oily and sooty coat tails. The new head of the EPA, who has famously sued the EPA numerous times at the behest of fossil fuel interests, has barely had time to settle into his new office before a chorus of carmakers rises up asking him to get rid of the fuel efficiency standards known as CAFE. But CAFE is our friend. 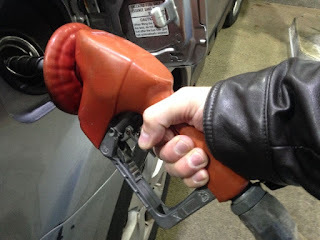 Under CAFE rules, American drivers of gasoline cars can count on saving $1.7 trillion dollars in fuel between 2011 and 2025, the lifetime of the rule. On the other hand, the auto industry would have lost $ 0.2 trillion because they are forced to sell you the car that better fits your needs rather than the oversized one they want you to buy that nets them higher profits. Carmakers don't care that you and I can save $1.7 trillion dollars. They do care that they can boost their profits by any amount. So they will do their best to get rid of the CAFE standards. And it's up to us to uphold those standards: for 1.7 trillion reasons plus the big one: the round, green and blue one that we all call home. This is why I say we're being ripped off at the pump. There's more: Those same car makers enjoy the income from the maintenance on your car: one of those engineering miracles, the internal combustion engine manages to translate raw and primal power (it doesn't get more raw and more primal than explosions) in the pistons to forward motion of several tons of steel, with you and your family in it, at highway speeds. It takes the fine tuning of a huge number of parts all working in unison to make than happen. Less than optimal tuning can lead to loss of efficiency, pinging, knocking, and in severe cases, engine death. No wonder we pay up to keep those engines in top condition. Electric motors are simpler. They have far fewer parts, and need much less maintenance. They don't require even oil changes because they don't have pistons that move at high speed under extreme temperatures and pressures (I tell you, they're an engineering miracle). EVs are a driver's dream - and a car dealer's nightmare. Car dealers make a lot of their money from maintenance. EVs are also a nightmare for Big Oil, who stand to lose their biggest customer, the driver of the gasoline car, altogether. So it's not surprising that dealers tend to hide their smaller cars, and push the larger ones. There are lots of stories about customers who need to be very persistent before they were allowed to buy an EV. But we must persist. We must insist that we can buy those EVs that are easy on the planet and easy on our budgets. And we must insist that the CAFE fuel efficiency rules remain in place.